My button is getting hot! What should I do? • Check all the isolators. They need to be screwed in firmly. • Check if the negative pole is firmly screwed into the battery cover (isolator). • Check if the copper pin of the button is firmly screwed into the button. • Check the distance between the button copper pin and the negative pole. This should be around 1.5-2 mm. Place all the copper parts in lemon concentrate or vinegar for around 15 minutes, then rinse them thoroughly with water and allow them to dry completely. When assembling, you need to attach the copper pin with pliers. Protect the copper pin with a tissue and hold the button with a rubber glove. The distance between the button pin and the negative pole should be around 1.5-2 mm. 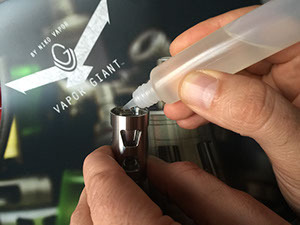 What should I do if my Vapor Giant leaks liquid? Are all seals in the proper place? Maybe a seal is no longer tight? 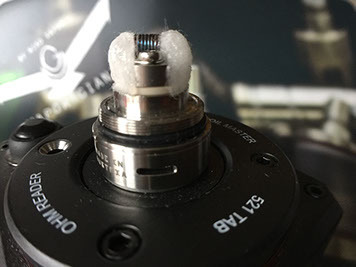 Is the rebuildable part firmly screwed into the base? Check the wrapping. 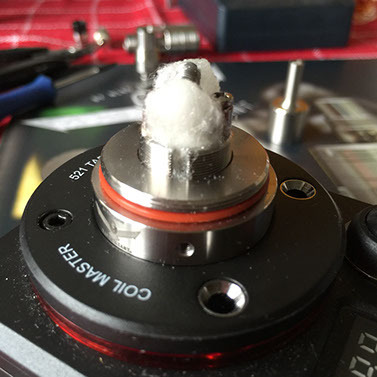 Is there enough cotton? Is the wrapping touching the positive pole? 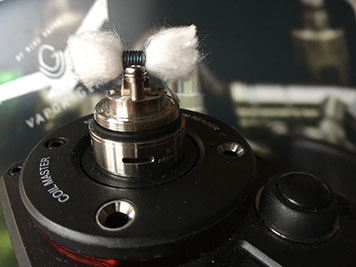 The cotton MUST be routed to the air flow channel by PASSING under the coil The cotton must NOT (not even a little bit) be placed in the air flow channel. 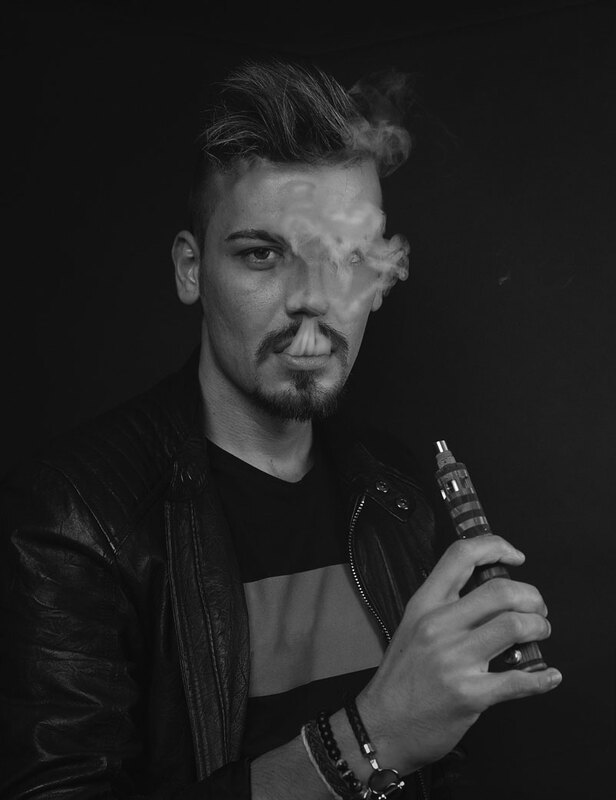 When carrying the Vapor Giant, whether in your pocket, handbag or in the car, close the liquid control and the air flow control. Vibrations (e.g., in a vehicle) or jerky movements (e.g., if the Vapor Giant falls over) can sometimes “splash” some liquid from the soaked cotton into the air flow channel. Closing the liquid control will limit the amount of liquid that could leak. Closing the air flow slits prevents the liquid from leaking onto your hand or into your trouser pocket during transport. I cannot unscrew the rebuildable part. Placing each end of a pair of tweezers into each of the liquid channels will make it easier to unscrew the rebuildable part. The positive pole block twists when I try to tighten the coil. 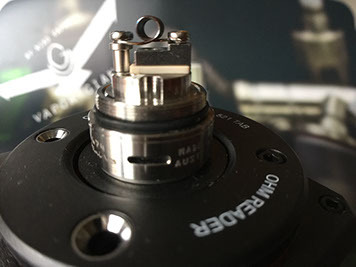 Insert a wrapping support with a diameter of 1.5 mm through the two air holes at the center pin and use this to tighten the positive pole block on the rebuildable part. I cannot detach the lower part of the top cap. Place each end of a pair of tweezers into each of the filling holes and then it should be easy to unscrew the lower part of the top cap. 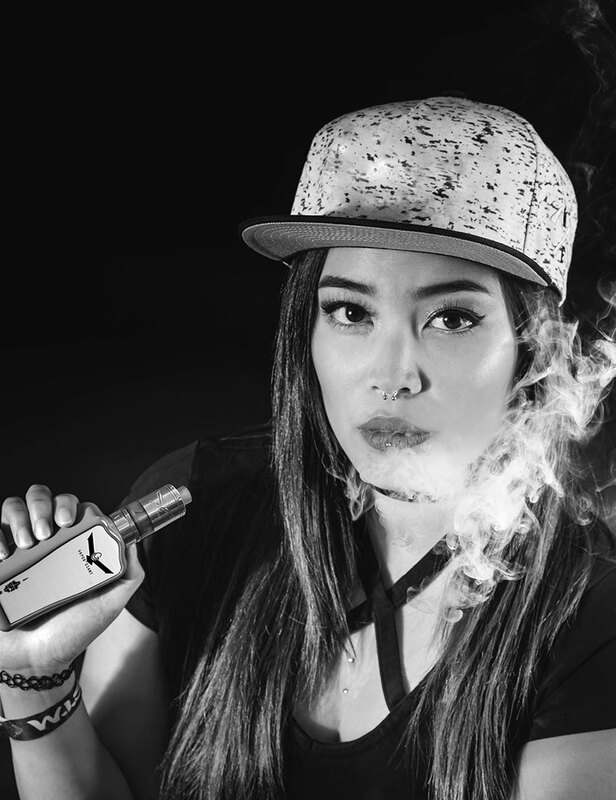 I cannot detach the base of the vaporizer from the top cap of the battery carrier. • Insert a suitable screwdriver into one of the air holes, then screw the base down with a rubber glove. • Put both parts into the freezer for around 30 minutes, and then continue with step 2. 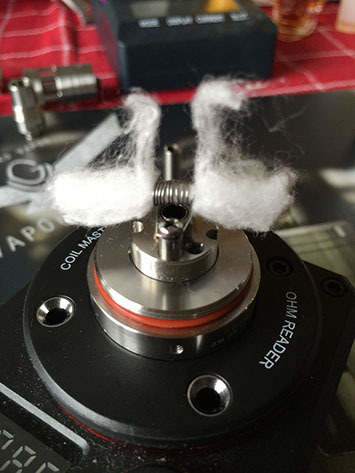 Pull the cotton through the coil so that it can be moved back and forth without distorting the coil. 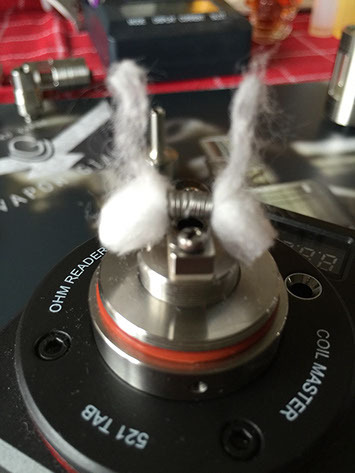 Next, use a pair of tweezers to lift two fine fibres and raise them up like “rabbit ears”. Then cut the cotton properly, as shown, and place the small fibres into the channels. The liquid control should only be screwed one turn, but this always depends on the base mixture used. 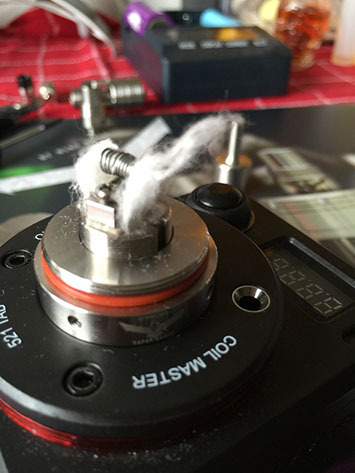 Pull the cotton through the coil so that it can be moved back and forth without distorting the coil. Then cut the cotton properly, as shown, and shape it well on the base. The channels must remain open! Which liquids should not be used in the polycarbonate tank? Liquid runs out of the AFC when I am filling it. What should I do? • Open the upper top cap and fill the liquid through one of the filling holes. • If the liquid control is open, do not put too much pressure on the bottle. • Check if both seals are present and wet them with some liquid. • Close the liquid control when you are filling with very runny liquid. 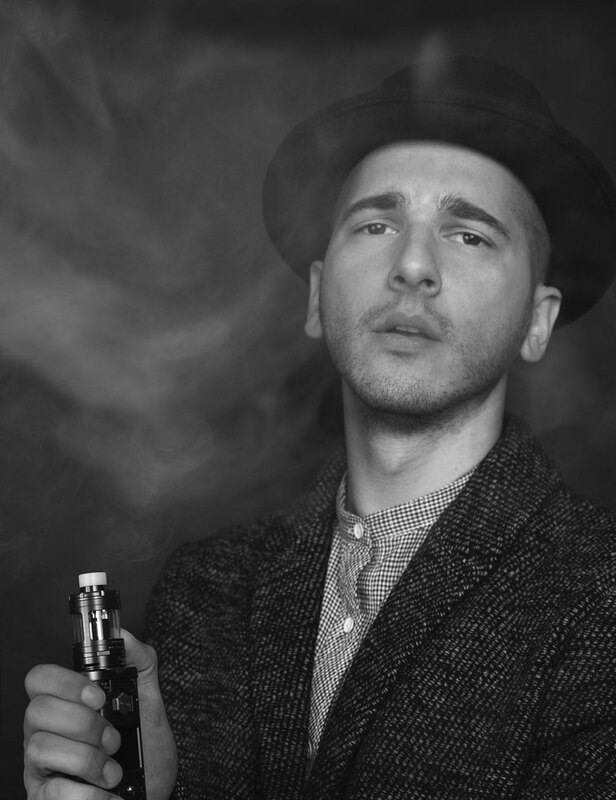 Until now, my liquids have always been pleasant for vaping. Now it feels like they are too strong. 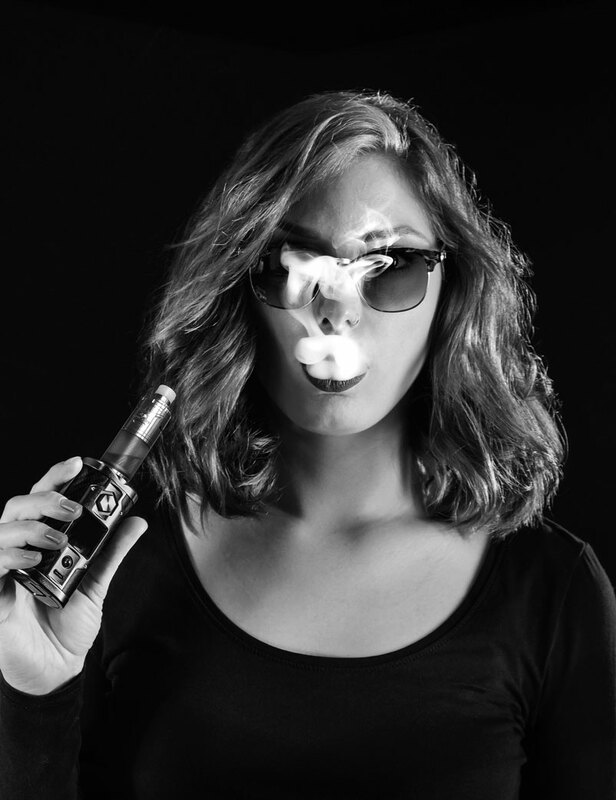 • In general, the lower the ohm of the wicking, the less nicotine should be used. • In addition, the flash can be slightly controlled by the height of the wrapping. Which battery should I get? Since our Vapor Giant battery carrier is a mechanical battery carrier, protected batteries should be used. If you are sufficiently knowledgeable and have an ohm meter, you can use other high performance batteries (> 20A). Vapor Giant™ assumes no liability in this regard! 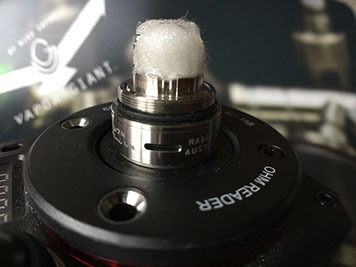 I want to use my Vapor Giant battery carrier in stacking mode. What should I keep in mind? • Only use new batteries from the same manufacturer and that are the same type! • Label the battery pair accordingly (e.g. 1 & 2), as this stacking pair should always be the same! • Always use the batteries in the same order (1 on the positive pole, 2 on the negative pole). • Also, the battery pair should have the same level of charge, so always load the batteries together! • Never stop the charging process early! • Always pay attention to the polarity! 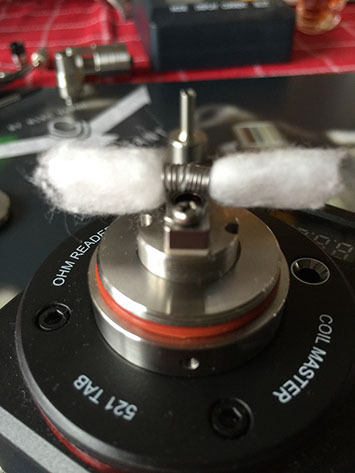 • Never wrap at an ohm level that is too low! Liquid runs out after I install the glass tank. Your package includes two silicone seals, which must be placed at the top and bottom of the glass insert. Also make sure that all the seals are well moistened with liquid. The flat seal for the glass tank twists when I screw it together. The flat seals must be well moistened with liquid. My striped glass tank shield is a different colour. We clean all products before shipment, but there may still be some laser residue here. Thoroughly clean the shield with soapy water and rub it dry with a leather cloth. There was no O-ring for the centre pin in the open draw kit. 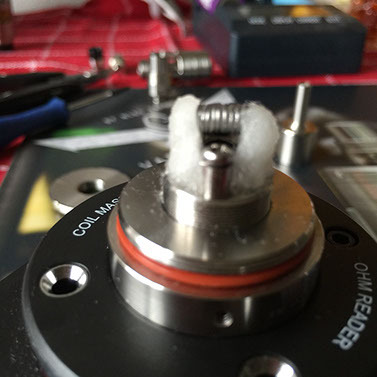 You can use the O-ring from the old centre pin. But you don’t have to use it at all because the positive pole does not protrude quite so far out! How do I fill the V3? You fill the tank with yor liquid, keeping the tank slightly inclined, and let the liquid run over the thread. This allows you to fill the tank very quickly and easily! After I changed the GO coil, my battery carrier indicates "No atomizer"
First, screw the base firmly onto the battery carrier and then screw the new head on firmly. After this, the correct ohm value should be displayed and the new head should be recognised. You may need to clean all the contacts/threads.